There is something very elegant and slick about 21 Casino that we cannot put our fingers on. Is it the user friendly interface, the smooth almost cloth like background, or the attractive jackpot? After a bit of though, we have come to the conclusion that it’s all of these and more. Notice that the casino does not depend on any wacky or cartoony vibe to attract its players. Rather, it attempts at mixing the real experience with the online by being on point. It is as if the casino conveys professionalism and an adequate feeling of sophistication that many other online gambling platforms seem to ignore, and exchange for a more "cute" feel. What we felt while we played was equal to as though a red carpet had been laid on the floor for only our shoes to make contact with. We felt special throughout our whole playtime, and this treatment should become an industry standard. To learn more why we had such a good time, please read below. It thrills the senses when discovering the array of games and their subsequent providers, 21 Casino boasts with. And what a number it is.  Over 40 game providers have added their signatures to 21 Casino. This should serve as evidence for the popularity and authority that the casino has. Varied is also the collection of types of casino games, starting from videos slots and stopping at poker, with the addition of BlackJack, Roulette and Classic Slots. On top of that the casino offers Live Casino games for players who treasure the authentic experience. Below are the featured game providers that supply 21Casino with top notch games. 21Casino doesn't leave its customers hanging. Take the experience anywhere you go, at any time with the 21Casino mobile version. Customer support is at its finest, with friendly and fast returns, the 24/7 Live Chat and email are top-notch additions. These are available in English, German, French, Norwegian, Finnish and Swedish. However, the only minus of this otherwise brilliant casino, is the lack of Phone Support, which might disappoint those players who, unexpectedly, stumble upon a more complicated issue. Such a grand casino must also be able to fend of unwelcome guests.  The site is secured by the most capable SSL encryption available. 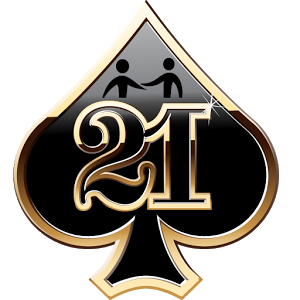 21 Casino has done, and is continuing, to provide the safest environment for online gambling, where all your data and transactions, including withdrawals and deposits, are securely locked away from prying eyes. All payments and withdrawals can be processed via a number of popular methods, including VISA, MasterCard, Maestro, GiroPay and others. 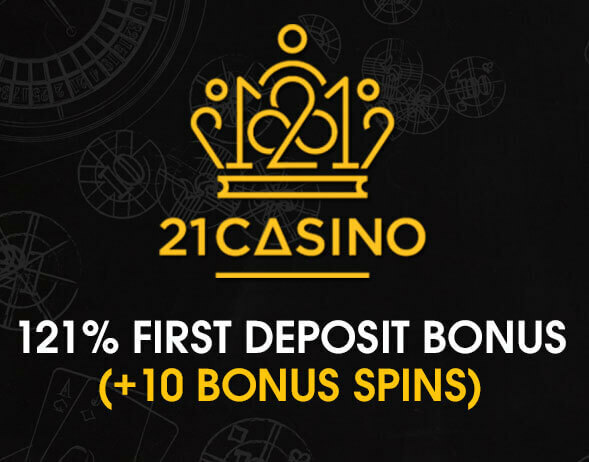 The First Deposit Bonus of 121% up to unlimited up to £300. 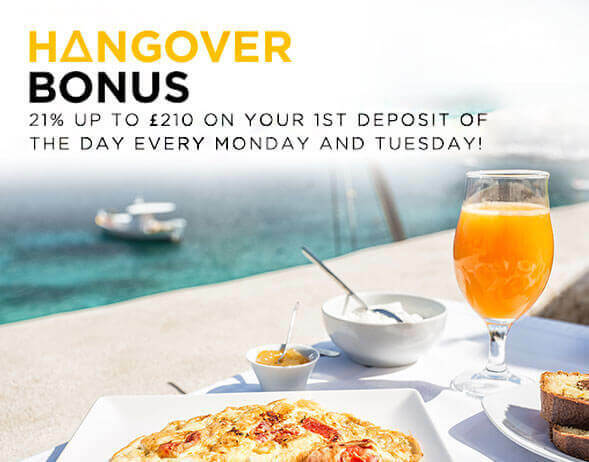 The Hangover Bonus offering a 21% up to £210 on your first deposit of the day for every Monday and Tuesday. The Stairway Bonus offer up to 50 free spins. 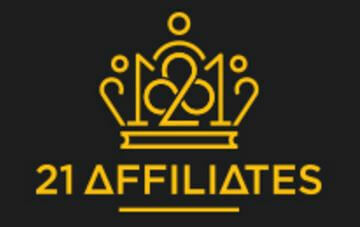 The Loyal Royalty Bonus builds you up Loyalty Points that you can redeem for cash. 21Casino treats players as its peers. Isn’t that what any gambler wants, nay, needs? This attitude towards is players and the overall design of the casino will keep players coming for more, for a long span of time. 21 Casino is what you might call a perfect package. It comes with just the right amount of features and design choices, so as not to seem too pompous. What are you still doing here?